Alaska Airlines Premium Class seats are now on sale for flights on and after January 5, 2017. The new cabin class is an Economy Class seat with a 35” pitch. Meanwhile, in regular economy the seat pitch is 31-32″ with the only exception being the exit row. 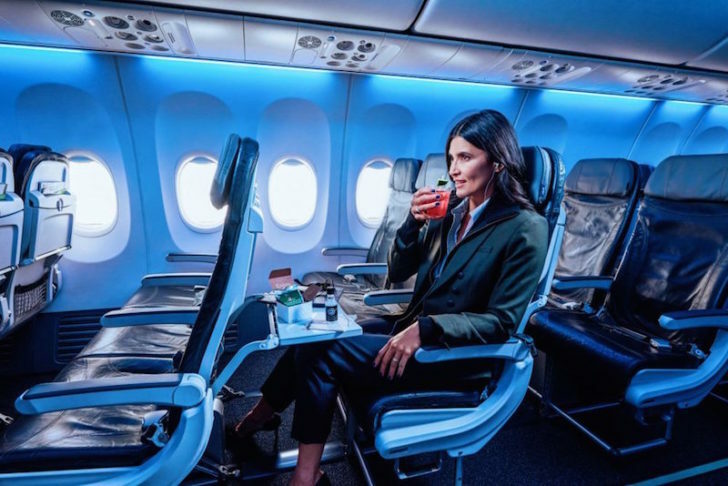 Alaska Airlines Premium Class passengers will enjoy new amenities including free snack boxes and alcoholic beverages along with priority boarding. Scott fully explained Alaska Airlines Premium Class, the perks, how to upgrade for free, and what differentiates Premium Class from Economy and First. Yet the question now remains, what Alaska Airlines Premium Class routes will be available in January, 2017? It is expected that nearly half of the fleet will feature Premium Class by the end by the end of 2016, with the balance of planes being reconfigured in 2017. Alaska Airlines plans to roll-out Premium Class to all 737-800s, 900s, and E-175s by the end of 2017. Planes are already in the process of being reconfigured, and many reconfigured planes are actually already flying! My contacts at Alaska Airlines tell me that all 737-800s will feature Premium Class by January 1, 2017. Currently Alaska Airlines has 61 737-800s, which represents nearly half of their mainline fleet of 149 planes. In addition, all E-175s already feature Premium Class and any new aircraft deliveries will also feature Premium Class. The 737-900/900er conversion will begin in 2017. 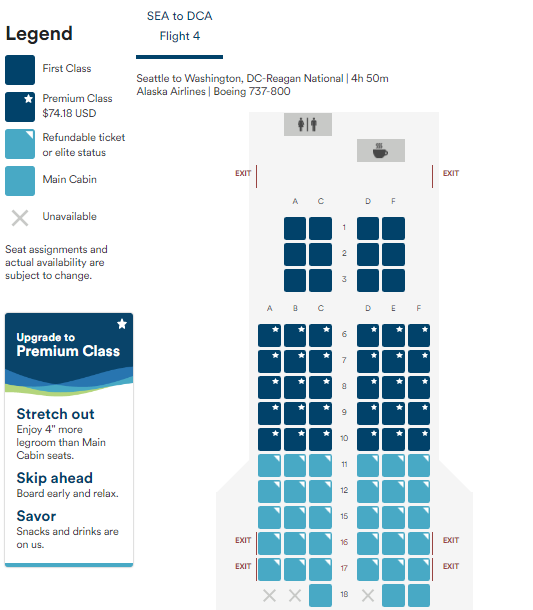 To know if your plane will feature Premium Class, or if you want to enjoy the extra leg room of Premium Class before Alaska starts selling these seats for as much as $79 one way, explore the flight seat map. A 737-800 with four rows of First Class has not be reconfigured. If there are only three rows of seats in First Class, then rows 6-10 will feature extra leg room aka Premium Class. For flights on or after 1/5/17 the seat map displays Premium Class seats in navy blue and a star. The upgrade to premium class can be done after buying an Economy Class seat. To see the seat map when purchasing a ticket, select “seats” under the flight you are inquiring about. A seat map will load and then you can figure out if you plane and route will feature premium class. Remember, 3 seats in First equals a three class configuration. More flights in 2017 will feature Premium Class as Alaska Airlines configures their 65 Boeing 737-900s. When those planes are retrofitted with Premium Class, the map will also display the seats in navy blue and a star. The 737-900 reconfiguration will not be as obvious though, as the 900 will still feature four rows of First Class. Planes and tail numbers change routes daily, at this time there is no guarantee that a route operated on January 6, 2017 with a 737-800 will be operated the next day with a similar configured plane. Some routes such as Hawaii are usually operated by a 737-800, but even that is not a guarantee. Until 2017, the only way to know which routes will feature Premium Class and which ones will not will be by checking the seat map.